That Leo Prideful SUN conjuncts big Macho MARS July 26 @ 4+ degrees of LEO. This marks a new cycle of action passion desires will strength courage creativity and drive for about the next two years. Are you ready? Sun conjunct Mars, Venus sextile the North Node, 26th July 2017! July 26, 2017 at 6:55 pm | Posted in Astrology | Comments Off on Sun conjunct Mars, Venus sextile the North Node, 26th July 2017! SUN conjunct MARS! this meet up brings in alot of energy, your mood may be better, your energy is higher, you may be more driven to take action, feel restless, as you have a burn inside of you. Of course this may mean some are driven by their ego! The Sun shines it light here, getting you ready for a more potent time ahead, connects you with passion and drive. Sun and Mars are wrapping up a two year cycle, endings and beginnings. Step into a new space, tap into the unknown and uncomfortable for awhile. Venus sextiles it up with North Node, your future is calling you, know what you what and don’t want, Have some idea of what that is. Mars and sun burn away the old and past. The combo of these two are reeving you up for what is coming your way. 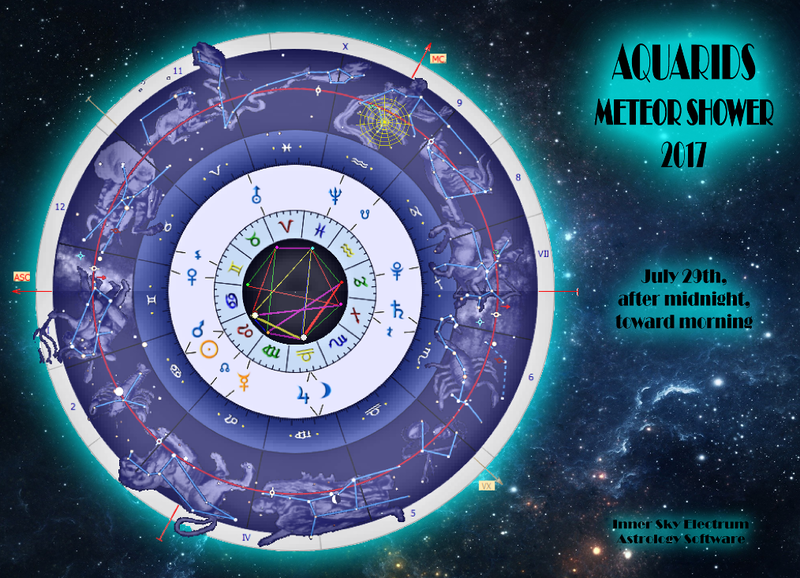 The Delta Aquarid meteor shower usually occurs every year between July 12 and August 23, this year best time to watch the sky is around July 27 and July 30, when the shower reaches peak intensity. The shower originated from the breakup of what are now the Marsden and Kracht Sungrazing comets. The Delta Aquariids get their name because their radiant appears to lie in the constellation Aquarius, near one of the constellation’s brightest stars, Delta Aquarii (in the right ankle or shin of Water-Bearer), widely known as ’Skat’ among astrologers (see zoomable chartwheel). By George Noonan, this ’fixed star’ gives good fortune and lasting happiness and also it is said to indicate safety in a deluge. Ancient Chinese actrologers knew it as ’Yu Lin Keun’, the ’Imperial Guard’. Snapshot: Tuesday night our words change from romance and fun to work and service. Wednesday our desires get Soulful and we have clarity around our romantic motivations. Early Thursday we have magical relating-ship clarity. At 7:45pm on Tuesday Mercury ingresses Virgo. Already in his Shadow, Mercury’s tone and purpose of thought and plans will change from having fun, being creative and taking center stage to analyzing things and being of service. He can also help you organize your day and decide to join a gym or other fitness routine. At 11:28am on Wednesday Venus at 24:17 Gemini Sextiles the North Node at 24:17 Virgo. As we communicate our desires, we are more Soulful about it. If you are writing poetry, it would be rather fitting as you can see your desires through the lens of other lifetimes. This can bring depth of expression.